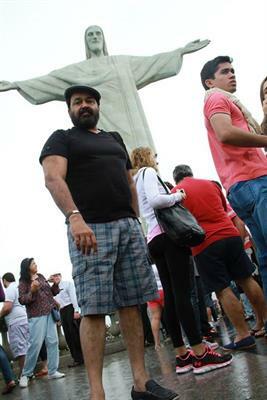 Superstar Mohanlal was spotted at Sao Paulo in Brazil where he is enjoying holidays along with his family. 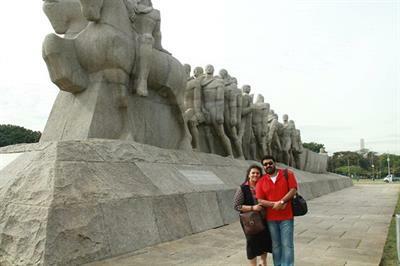 Currently the actor is touring Brazil taking a break from the first schedule of his Tamil project Jilla along with Vijay. Now it is confirmed that the actor will not have an Onam release, first time in many years. It is also known that the actor deliberately slowing down on the number of films to be done in a year. The much hyped 'Onnu Muthal Aaru Vare' helmed by director Johnny Antony which was projected as his Onam release was opted out due the reason that the script had him playing a character larger than natural life which the actor had done several time in the past. Mohalal who is having millions of fan followers have already expressed their disappointment over the social media sites. Subish Sunny an ardent fan of Mohanlal shared his displeasure with us. "It would be first time in my life time going to spend an Onam without Lalettan's movie. Being a fervent fan of Mohanlal, it is a real miss for me and others who wished to enjoy the Onam treat delivered by Lalettan. Any way waiting for his other upcoming projects." said Subish. After his return, the actor will start working with Priyadarshan for Gitanjali in July. Later he would join the sets of Jithu Joseph's My Family from September end. There are a number of movies which has been reported to have Mohanlal in lead. Mohanlal's yester year's movie Rajavinte Makan will be having a sequel which is titled as Rajavinte Makan II. Heard from the grapevine, Dennis Joseph has completed the scripts and the shooting is expected to start in October. Another anticipated project on pipeline will be Hariharan - MT Vasudevan flick 'Randamoozham' in which Mohanlal will share screen space with Mammootty. Produced by Gokulam Gopalan, Mohanlal would be playing the role of Bheema, while Mammooty plays Dhuriyodhana. He will also be seen again in Sandalwood along with Puneeth Rajkumar. A Hollywood movie directed by Nayan Padrai which tells the tale of a stock exchange genius Raja Rathinam is also under plans. It is also heard that the actor will be busy in 2014 too with a number of movies in kitty. Teaming up with Renjith Mohanlal is doing his next titled Planter Avarachan. VM Vinu's Happy Singh, Rajesh Pillai's 'Lucifer' and Arun Vaidyanathan's 'Peruchazhi' are also on cards. Peruchazhi will be political completely shot in the US.